A powerful and internationally acclaimed series of public service announcements to raise awareness for all thirty of the fundamental human rights guaranteed to every human being on earth by the Universal Declaration of Human Rights, the charter championed by Eleanor Roosevelt at the United Nations. Presented here in dramatic vignettes are all thirty of the human rights, including the Right to Equality, Freedom of Belief and Religion, the Right to Adequate Living Standard and the Right to Education. Human Right #2: Everyone has the same rights, no matter their differences. Human Right #3: Everyone has the right to life and to live in freedom and safety. Human Right #4: Everyone has the right to freedom from slavery. Human Right #5: Everyone has the right to freedom from torture. Human Right #6: Everyone has the same fundamental rights no matter where they go. Human Right #7: Everyone is equal before the law. Human Right #8: The human rights of everyone are protected by law. Human Right #9: Everyone has the right to not be unjustly imprisoned or banned from their country. Human Right #10: Everyone is entitled in full equality to a fair and public hearing by an independent and impartial tribunal, in the determination of his rights and obligations and of any criminal charge against him. Human Right #11: Everyone is innocent until proven guilty and everyone has the right to bear evidence to prove their innocence. Human Right #12: Everyone has the right to privacy in their homes, their communications and their personal affairs. Human Right #13: Everyone has the right to go where they want in their own country and to travel as they wish. Human Right #14: Anyone has the right to overcome maltreatment in their own country by finding asylum in another, safer country. Human Right #15: Everyone has the right to belong to and be a citizen of their own country. Human Right #16: Everyone has the right to marry and raise a family. Human Right #17: Everyone has the right to their own possessions. Human Right #18: Everyone has the right to freedom of thought. Human Right #19: Everyone has the right to freedom of expression. Human Right #20: Everyone has the right to assembly. Human Right #21: Everyone has the right to take part in their own government. Human Right #22: Everyone has the right to social security. Human Right #23: Everyone of age has the right to hold a job, to a fair wage for their work and the right to join a union. Human Right #24: Everyone has the right to rest from work. Human Right #25: Everyone has the right to be cared for. Human Right #26: Everyone has the right to an education. Human Right #27: Anyone, including groups, has the right to their own artistic creations and writings and to have sole right of reproduction and distribution. Human Right #28: Everyone has the right to a fair and free world in which there is enough order to enjoy their rights and freedoms. Human Right #29: Everyone has a duty to others and to help protect human rights and freedoms. 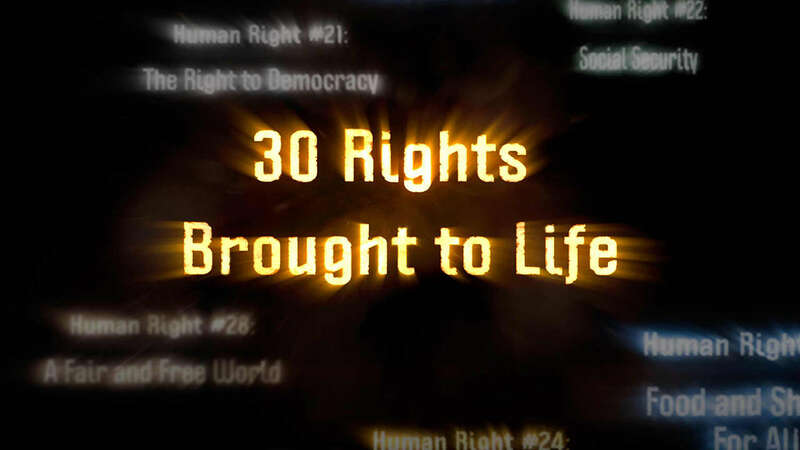 Human Right #30: Human rights are inherent and no one can take them away.